As I go over my queue of TV shows that I committed to review, I feel like I've made a lot of bad TV choices. In a post-Firefly world, it feels essential to support science fiction and fantasy shows in order to help "protect" the genre from the hacking and slashing of narrow-minded television executives. But at the same time, recent years haven't been all that great in terms of the types genre television that has been created. And while I still don't want to lose another show before its time in a Firefly fashion, one also has to recognize that not all shows are Firefly either. I really wanted to like Defiance. It has a lot going for it including a somewhat Firefly-like setting and a nice diversity of alien races that sort of reminds me of Babylon 5 or Farscape or something. And it had some tie-in with a video game franchise right off the bat. So the show had a lot going for it, right? But then things just got mired down in rather shoddy storytelling and lackluster characters. Let's face it, SyFy hasn't been all that great in terms of bring out new science fiction shows of decent quality in recent years. Let's be shallow and blame the name change or something. 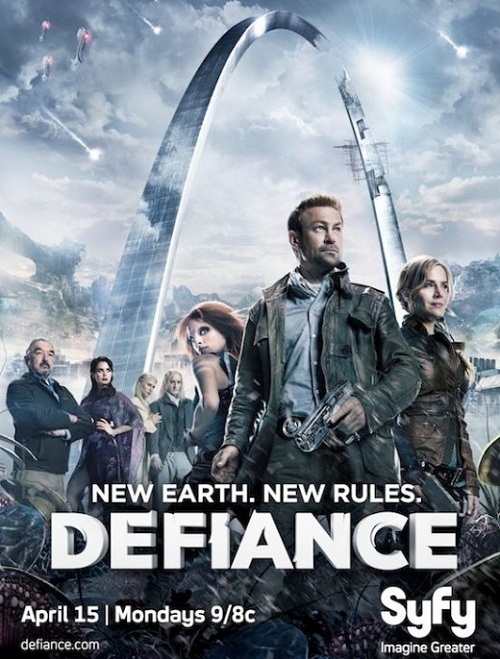 Synopsis: Defiance is a US science fiction television drama developed for television by Rockne S. O'Bannon, Kevin Murphy, and Michael Taylor based on the MMORPG of the same name. In the US it airs on SyFy. It is the year 2046 and the Earth is no longer quite what it used to be. A group of aliens known as the Votan had arrived years ago in the hopes of finding a new home for themselves. They had left for Earth more than 5,000 years ago and believe the planet to be uninhabited, but by the time they arrived this was clearly no longer the case. Tense negotiations between the Votan and the humans eventually broke down and descended into a conflict known as the Pale Wars. And the war raged on until the Votan Ark fleet was mysteriously destroyed, thus causing "Arkfall" with the various ships and their exotic technologies falling to Earth. Thus in the "present" Earth, the twisted landscape is the outcome of the war, the destruction causes by the Arkfall and the side-effects of alien terraforming technology let loose upon the planet. We mostly follow around Joshua Nolan (Grant Bowler) and his adopted Irathient daughter Irisa (Stephanie Leonidas) as they settle down in the city-state of Defiance. And this city actually has a widely diverse population of humans and different Votan races that (for the most part) live together in harmony. Joshua ends up becoming Defiance's lawman - pretty much their sheriff. And he'll need to keep his head straight in order to deal with the various figures that operate out of Defiance. The series certainly started out promising - the back story was pretty rich and there were a lot of nuances to the setting that are certainly worth exploring. The fact that the Votan are actually a group of aliens and not just a single species did present for some instant diversity on the show and again more potential stories. But then the stories never really got anywhere all that significant throughout this first season apart from Nolan investigating practically random crimes, Irisa going off on her own business, and of course the scheming of the Tarr Family - Datak (Tony Curran), Stahma (Jaime Murray) and to a limited extent their son Alak (Jesse Rath). As much as the Votan are a diverse conglomorate of different aliens, the Castithans seem designed from the ground up to be unlikable and strange. And this goes beyond they fact they look like even whiter albinos, but more because their demeanor has te fantasy geek in my calling out "ELVES!" every time they're on screen. I'm not sure what the big goal was in casting Julie Benz as Amanda Rosewater, mayor of Defiance. Given the whole slightly post-apocalyptic setting, you'd expect that anyone who manages to rise to the top of the food chain would be a pretty strong individual. Amanda only seems to be pretending to be strong (and badly at that) but I don't understand how she became the leader of this little community. She wasn't all that strong a character back on No Ordinary Family, and nothing has really changed since then. Defiance had a lot of good going for it on paper but the creative team clearly had no idea what to do with all that they had been given. And while I never played the game, a lot has been said online about the lack of significant connection between the two properties, thus further weakening the show. Thus this first season only really gets 2 efforts by someone to blow up Defiance out of a possible 5.